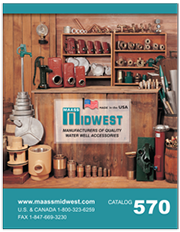 A Brief History of Maass Midwest, Inc.
Carl B. Carlburg founded Midwest Well Supply in the early 1930’s. The company quickly became a leader in manufacturing check valves, well points, pumping cylinders, drive shoes, well service tools, and brass fittings. Midwest Well Supply moved from Chicago to its present location in Huntley, Illinois in 1952, and was acquired by Winrock Enterprises of Little Rock, Arkansas, in 1984. Robert Dicken invented one of the first pitless adapters, and in 1941 founded Dicken Manufacturing to produce this innovative product for the water well industry. Dicken Manufacturing consisted of a machining facility and brass foundry. In addition to the pitless adapter, this Arcadia, Ohio, plant also manufactured well caps, tank tees, and cast brass insert fittings. Winrock Enterprises acquired Dicken Manufacturing in 1975, and in 1984 merged it with Midwest Well Supply. In 1952 Herb Maass began production of the Maass Pitless Adapter in his basement. Recognizing the significance of this product, Surinak Engineering and Manufacturing acquired the Maass Pitless Adapter in 1972, and moved its production to New Berlin, Wisconsin. Due to sales and product expansion into custom pitless units, tank tees, and sewage pump adapters, Maass moved into a new, separate plant in 1979, located in Muskego, Wisconsin. Maass Manufacturing acquired Midwest-Dicken from Winrock Enterprises in 1990. The name of the company was changed to MAASS Midwest Manufacturing to reflect the largest brand segment of its quality product lines. The product lines and manufacturing operations were merged together at the Huntley, Illinois plant during 1992, to offer its customers a better, centrally located, one source service location for their water well accessory needs. 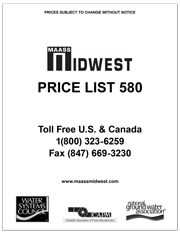 The year 1999 saw the addition of Pacific Hydro Products to the MAASS Midwest Manufacturing family. Pacific Hydro, located in Grass Valley, California, was a manufacturer of high quality steel well seals and water tank air chargers. 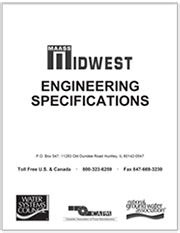 These two fine products round out MAASS Midwest’s water well system accessory lines, providing our customers a complete one stop source for quality standard and custom water well products. ©2005-2018, MAASS Midwest Manufacturing, Inc. | All rights reserved.